Recognize the quality of your contacts in the blink of an eye and interact with newsletter contacts accordingly. To give you a good overview of reader engagement, our newsletter tool provides you with a very useful feature: newsletter contact rating. People are rated on a scale of one to five. You can use this information to your advantage to create a special campaign to your most engaged contacts, or send a re-engagement campaign to those who haven’t been engaging with you recently. A customer re-engagement campaign is much cheaper (and probably much more effective) than the acquisition cost. Contact rating works just like other customer trait in your list, which means that you can easily access it or create segments if you’d like to. 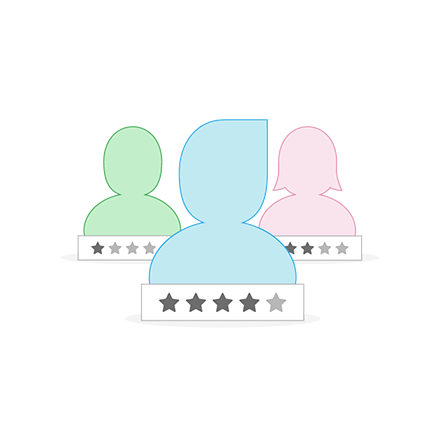 Every single contact within a Newsletter2Go address book will receive an individual newsletter contact rating. The contact rating is automatically generated by the newsletter software based on that user’s past interaction with your newsletters: how many he or she has received, opened, clicked, or simply deleted. A rating from zero to five gives you an immediate picture of the contact’s quality. The more active a contact, the higher the rating, obviously. Your groups will also be given a rating based on the average rating of all the group’s members. The newsletter contact rating can also be used as its own identifying trait. This means that you can use it to create new, more targeted groups based on your contacts’ activity levels. Send active contacts loyalty offers, and send reactivation campaigns to inactive contacts. With the email marketing software from Newsletter2Go, the possibilities are infinite. The contact rating can also be used as its own identifying trait. This means that you can use it to create new, more targeted groups based on on your contacts’ activity levels. Send active contacts loyalty offers, and send reactivation campaigns to inactive contacts. With the email marketing software from Newsletter2Go, the possibilities are infinite. If you’d like to up your customer relationship game, send a targeted campaign to highly rate contact. Reward them with special deals, discounts, or special events. Free shipping should also sit well with loyal customers. It’s very likely that your email list contains some subscribers who simply don’t engage with your campaigns. Target newsletter contacts with a low rating and run a re-engagement campaign. Asking for a quick feedback with a survey is a good place to start. Then, you can try sending an exclusive offer, promote a give-away or focus on personalization. Some subscribers might not re-engage despite your best efforts. Once you’ve determined who won’t engage back, remove these contacts from your email list. Remember that low deliverability rates might trigger spam filters.